You've probably seen two beads of liquid coalesce hundreds of times in your life. Maybe thousands. But we're willing to bet you've never seen them do it in slow motion. At the very instant the drops meet, an infinitesimally small neck is formed between the droplets. 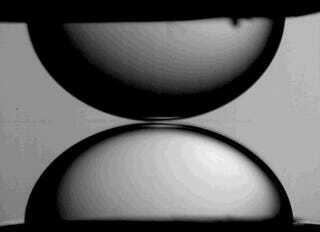 Mathematically speaking, the pressure and curvature of the droplets diverge as a result of this tiny contact area. This is an example of a singularity. Surface tension rapidly expands the neck, sending capillary waves rippling along the drops as they become one. Like most high-speed videos of water, the process is positively mesmerizing to behold. Not to mention ridiculously satisfying. More catharsis and visceral satisfaction here, here and here.